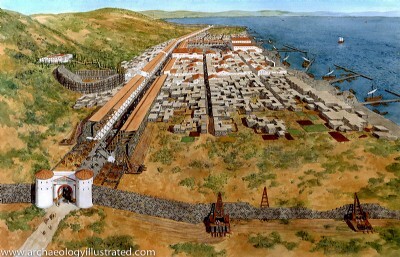 Herod Antipas built Tiberias from AD 18 to 22 naming the city after the Roman Emperor Tiberius (17–34). Then he moved his capital from Sepphoris to Tiberias. For over twenty years excavations of ancient Tiberias have been underway. One of the major finds is the Roman Gate that is located at the south end of the city. According to the excavators Herod Antipas (4BC - AD 39) built this gate when he constructed the city of Tiberias. (AD 18-22). This images in this section are of the south gate and theater. For the excavations at Tiberias, see: Hirschfeld, Yizhar, Gideon Forester, and Fanny Vitto. "Tiberias." Pages 1464-73 in The New Encyclopedia of Archaeological Excavations in the Holy Land. Edited by Ephraim Stern, Ayellet Lewinson–Gilboa, and Joseph Aviram. Jerusalem: Israel Exploration Society and Carta, 1993 and Hirschfeld, Yizhar, and Oren Gutfeld. "Tiberias." Pages 2048-54 in The New Encyclopedia of Archaeological Excavations in the Holy Land — vol. 5 — Supplementary Volume. Edited by Ephraim Stern, Ayellet Lewinson–Gilboa, and Joseph Aviram. Jerusalem and Washington, DC: Israel Exploration Society and Biblical Archaeological Society, 2008.